Over the last few years our family has taken a formal approach to tasting food. 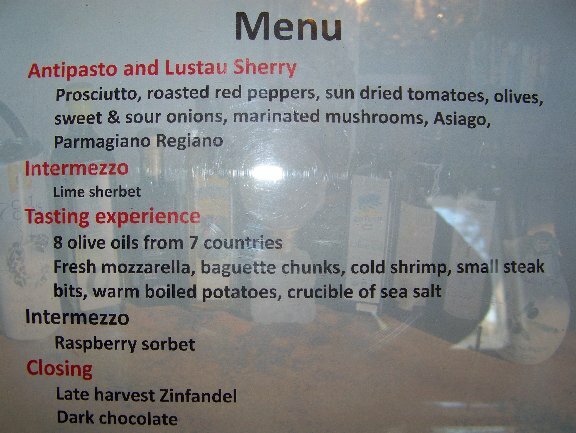 Of course we offer vinegar tasting to all tour groups but our private tastings have been pretty interesting. Pickles, mustard, chocolate, blue cheese, and Scotch have been among the themes. 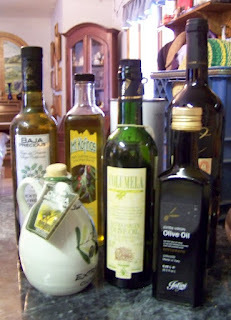 This last Saturday, we compared nine olive oils from seven countries. Our daily olive oil has been one we buy by the gallon. It comes from the Middle East and has only a small amount of English on the label. 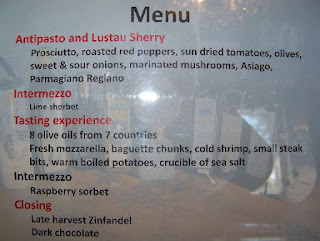 It does say, “Pure Olive Oil.” Other olive oils in our tasting included: Cat Cora’s Kitchen Greek, Italian Colavita, Baja Precious from Mexico, Zatoun from Palestine, Spanish Carozzi, Mt Kofinas from Crete, Columela also from Spain, and Italian Affiorato. Son-in-law Jim had a great time with online shopping for the oils. They came in a lovely variety of sizes and shapes of bottles. The antipasto set the atmosphere. We started before noon and allowed plenty of time to taste and savor. Following the intermezzo, we took a little break while Jim set up the formal tasting offerings on the dining room table. He provided special spoons in which to pour the different olive oils to allow tasting of the singular characteristics of each. While it might seem off-putting to sip pure oil from a spoon, we soon forgot our American reluctance for such a straight forward approach to olive oil. Jim had thoughtfully provided comment sheets which we did our best to use. Comments appeared: nice, fruity, nutty, grassy, peppery, nice olive flavor, light, heavy, musty. Several of us chose the Palestinian Zatoun as our favorite. We’ve long heard that Americans prefer mild olive oils. I expected that one or more of these would be strong flavored but found all of them to be mild to my taste. We’ve used olive oil in cooking and for dipping for many years. Maybe we have developed more worldly taste buds. Vinegar has long been touted as beneficial to the human body. Olive oil is tasty and a great carrier for the fat soluble vitamins. I learned that I prefer my olive oil mixed with some sea salt and one of our Leatherwood Vinegars. The oil provides a bass note while the salt and vinegar sing the melodies. Whether for salads, marinades, or condiments, oil and vinegar mix well. We will continue to use our Middle Eastern variety while it lasts (our source has gone out of business) and experiment more with the Zatoun and Carozzi which Ron found to his liking. We highly recommend this kind of event for a family gathering. It’s a real conversation stimulator and fun activity for the whole family.